The furore surrounding the future of a west London college in the shadow of the Grenfell Tower has made it to the House of Commons, after the skills minister promised to find the “right solution” for a “precious” community asset today. During the regularly scheduled education questions, Anne Milton discussed the doomed merger plans between Kensington and Chelsea College, and Ealing, Hammersmith and West London College, which the FE commissioner Richard Atkins has scrapped as exclusively revealed by FE Week on Saturday. She was addressing Kensington’s Labour MP Emma Dent Coad, who had told her said that “our bereaved community needs its local education services” in the wake of the deadly blaze, and asked if the government would secure “the financial future of a community led college along with a diverse and locally representative board”. “I was delighted to meet with campaigners,” Ms Milton replied. “I would congratulate the FE commissioner for stepping in and having numerous meetings. 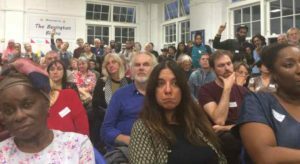 Kensington and Chelsea College had been pressing ahead with merger plans in the face of massive local opposition – and especially fears that the resulting conglomeration would have closed its major Wornington Road campus, which is close to the tower block where 71 died last June. But on Friday, Mr Atkins told campaigners that the merger was off, after he and the minister intervened. The Wornington campus has been a popular place of learning for many of Kensington’s less affluent residents, among them people who lived at Grenfell. The campus is one of the college’s two main sites, and was recently sold under a lease-back deal worth over £25 million to the borough council, which soon outlined controversial plans for the site which would at best have resulted in greatly reduced teaching space. But Kim Taylor-Smith, who took over as deputy leader of the council in July and is lead member for Grenfell recovery, said he had listened to a huge number of complaints about the plans, and paused the campus redevelopment plans. “We are really pleased that Richard Atkins reached the decision he has, but it is against a backdrop of sadness as we know all of this government intervention wouldn’t have happened if it hadn’t been for all the loss of life at Grenfell, and the need they now feel to repay the community,” said Edward Daffarn, one of the leaders of the Save Wornington campaign, who himself escaped from the fire. “It is now important that we secure the long term future of the Wornington campus, which cannot be done simply through the college securing a 10 year lease on the site. A merger between two London colleges has been called off following direct intervention from the FE commissioner, triggered by fallout from the Grenfell Tower fire tragedy. Kensington and Chelsea College had been pressing ahead with plans to merge with Ealing, Hammersmith and West London College, despite massive local opposition. But Richard Atkins told campaigners yesterday that it was now off. One of their leaders Meg McDonald, from The Save Wornington College group, which has been working in partnership with campaigners battling for justice following the Grenfell Tower fire, has thanked the thousands of people who helped fight to stop it. “The merger is definitely off and that’s because of you whether leafleting and fly posting, emailing the governors and the principal, lobbying governors meetings in the cold, getting the petition signed, standing at the stall on Fridays, coming to meetings with your ideas, investigating legal matters, writing letters, speaking at meetings for the campaign, you have been the core of this campaign,” she said. She added the FE Commissioner will share the report of his team’s recommendations next week. Mr Atkins was sent in before Christmas to review the situation, along with further intervention from skills minister Anne Milton, in-part because KCC’s Wornington campus is in the shadow of Grenfell Tower, which was struck by tragedy last June when 71 people died in a huge fire. The final vote by KCC board of governors either to accept or reject a merger with Ealing, Hammersmith and West London College had been due to take place on December 18. But they agreed to delay at least until the end of next April, after Ms Milton and Mr Atkins made fresh recommendations. FE Week has had it confirmed separately that the merger is off. “They will be looking into the quick sale of the college, other partnerships, proper consultation with the community and other interested parties, speaking to the council to negotiate a better and longer lease for Wornington, and the finances,” Ms McDonald said. More than 1,600 campaigners who oppose the merger have signed a petition to be handed to college leaders. They believe convinced the resulting super-college would have been more likely to allow the local council to redevelop KCC’s Wornington Road campus, situated close to Grenfell Tower, which was devastated by fire over the summer killing 71 people, for housing. Wornington has traditionally been a popular place of learning for many of the sort of less affluent residents in the local area, for example it has been people who would have lived at Grenfell. Mr Atkins visited KCC last month under orders from Ms Milton to review the merger plan which were meant to go ahead from January. Campaigners, led by Grenfell survivor Ed Daffarn, had been saying for months that they felt confident they would stop the merger, because they believed that would be given special consideration by the government because of the Grenfell fire tragedy. Ms McDonald added that “many people have asked how to seek the dismissal or resignation” of Kensington and Chelsea College’s chair of governors, Mary Curnock Cook, also a former UCAS boss, and principal, Dr Elaine McMahon, who have remained committed to the merger as local opposition has mounted. The Wornington campus is one of the college’s two main sites, and was recently sold under a lease-back deal for £25.3 million to the borough council, which then outlined plans for the site which would at best result in greatly reduced teaching space. But Kim Taylor-Smith, who took over as deputy leader of the council in July and is lead member for Grenfell recovery, said he has listened to a huge number of complaints about the plans, and paused the campus redevelopment plans. The Department for Education has not commented so far.